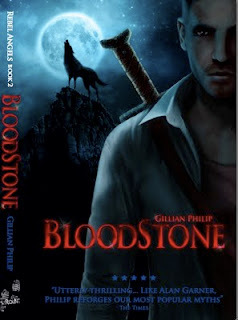 Bloodstone, by Gillian Philip, is the follow-up to Firebrand, which came out last year and introduced us to the world of the Sithe. The Sithe are faeries – but don’t think gossamer wings or glitter, or indeed anything that’s pretty and dainty. This lot are fierce, violent, and very down to earth. They live in a parallel world (parallel to Scotland), or maybe another dimension of this one, and can cross between their world and ours pretty much at will. – where they have an even more tumultuous time falling foul of a witch-hunting priest and, in the case of Seth, falling in love with a mortal girl. Wherever they are, life doesn’t come easy for the two brothers. The pace is swift, and the book fairly crackles with energy. By the time the next book begins begins, several centuries have passed and the brothers, with another Sithe couple and their daughter, are in 21st century Scotland. They are still hunting for Kate’s Bloodstone, but without success. They have made illicit trips back to their own world and got away with it: but their luck is about to run out, and the ensuing cataclysm engulfs mortals and Sithe alike. The fantasy world is strongly grounded in reality. We are convinced by this world partly because in many ways the Sithe are all too recognisably human, albeit with that gloss of alien glamour, but we are also drawn in by Seth, whose voice as the narrator is direct, powerful, and very convincing. To him, the Sithe are obviously real, and it’s the mortal – us – who are the ‘other’; and so while we’re in the world of the novel, that’s how we see it, too. He’s violent and quick tempered, but he’s also capable of great affection and loyalty – particularly towards his brother. He’s also very funny, and he usually wins. So he’s an attractive hero – we care about him and about Conal, and we go willingly with them on their adventures. These books – there are to be two more, and the title of the series is Rebel Angels – are action packed and enthralling, whether or not you are normally a fan of fantasy. 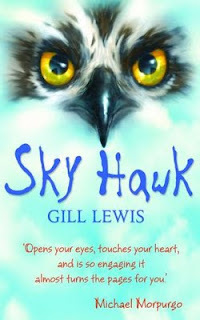 Sky Hawk, by debut novelist Gill Lewis, couldn’t be more different – except in that it’s also set in Scotland and, much more importantly, that it too is a very, very good book. It’s about two young teenagers and their discovery in the Scottish Highlands of a rare osprey’s nest. It’s beautifully written and the characters are complex and real; the narrator, Callum, has to negotiate his way between his old friends and Iona, his new one. So far, the territory is fairly familiar. But then, half way through, something very unexpected happens, and after that the narrative takes a turn that I hadn’t anticipated at all. There is no fantasy element, nothing which isn’t perfectly feasible: but all of a sudden, I was completely gripped and couldn’t put it down – it’s a cliché, but it’s what happened: I lost sleep for this book! And I didn’t mind, because when I’d finished it, I felt that rare and precious sense of seeing the world a little differently which only happens with a very good book. It’s also very beautifully produced. The cover’s striking, the book's a nice size, it has generous margins and lovely little sketches of the landscape at the head of each chapter. In every way, this is a pleasure to read. Great introductions to two new & different books - will definitely look forward to reading them now! going out to buy Sky Hawk. Thanks Sue!